Simply one of the best hybrid games we've played all year. The age of the hybrid game is upon us. We have Tamagotchi/RPG/MMOs in the form of Rage of Bahamut and Blood Brothers. Meanwhile, Slydris combined Lumines with sliding-tile puzzles, and Shellrazer was a gloriously daft rockets-meets-runners game. Given this good gaming fortune, I was all-ears when, knowing my obsession with match-threes and growing weariness for the endless-runner, a friend urged me to download 10000000. The upgrade system in 10000000 is a stroke of genius. You are, for all intents and purposes, an Indiana Jones character trapped underground for reasons unknown in this 8-bit adventure tower. On your first attempt at the game, you wake up in a basement that consists of some boarded-up doorways and a single, enormous dungeon gate you can pass through. Once inside the dungeon proper, your character runs against the clock at the top of the screen, while you have to deal with a variety of different obstacles that get in his way. Below him, you have a random selection of tiles which you move as entire rows or columns to create the necessary three-or-more match-ups. You need to consistently juggle your tile-matching priorities. 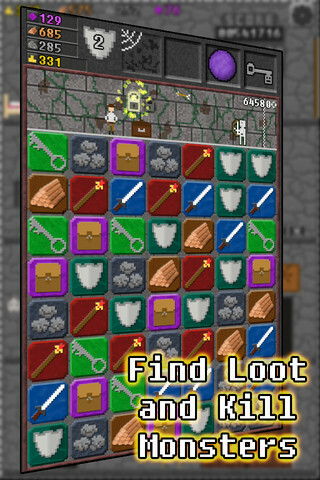 Run into a treasure chest, and you'll need to match up two sets of key icons to progress further, or crack just one lock for doors (more in later levels). Enemies require sword-play match-ups and magical staff combos if you're to gradually whittle away their health. If you fall too far behind the pace, then the current turn ends and it's back to the basement. It's an incredibly frantic and exciting experience, as you constantly juggle priorities while bringing useful tiles into play. But it's back in the basement where 1000000 gets really interesting. 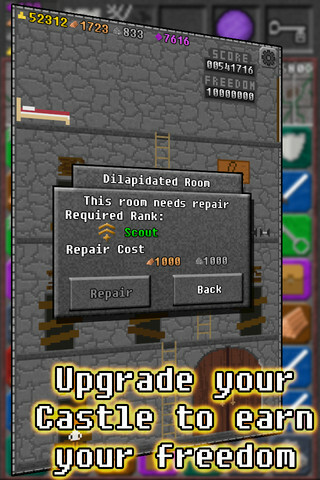 As well as simply surviving and going for a new high score on each run, you're also earning currency and materials which you can use to upgrade the tower itself. Get enough stone match-ups, and you can unlock the blacksmith so that your sword can be sharpened to do more damage. There's a gym to boost various stats and perks, as well as a stave-maker who can weave more magical power into your staff. Yep, that pretty much sums this wonderful game up. 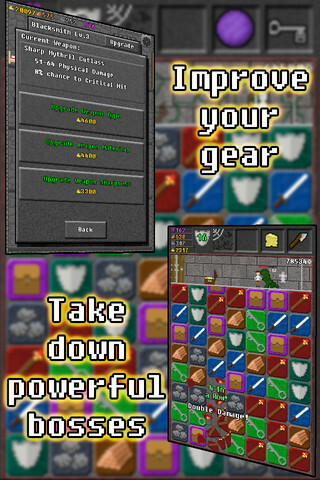 Despite countless hours of playing the game this weekend, there are still more upgrades to be unlocked, and developer EightyEight games has managed to achieve the impossible: make the increasingly weary endless-runner genre exciting and compelling by first blending two distinct genre types, then adding this incredibly satisfying RPG component. Is there an end for this endless-runner? Well, according to a scoreboard in the basement, hitting that magical 10000000 cumulative total leads to freedom. We'll have to let you know what happens when we get there, and you can be sure we'll reach it, because when we come to compile our games of the year this December, 10000000 will have a very high position on that list. What's Hot: An ingenious combination of genres, with a great RPG system to keep you engaged beyond mere high-score chasing. What's Not: The game does a fairly poor job of explaining the upgrade system.